Pastor Larry Edwards of the Southview Grace Brethren Church in Ashland, Ohio, indicates that the church’s summer outreach activities are in full swing. On Sunday June 3, Southview held a dedication service for the summer ministries of the church. Kelsey Edwards is traveling to Thailand for a short-term missions trip. This is her second mission trip to Thailand, having served with OBI in 2005. The junior and senior high youth will tour and serve in the Washington D.C. area during August. An adult team will travel to the Dominican Republic in August to move and set up a generator, finish some painting, and set up computer labs at a Christian School on the island. June 29-July 4 is Wifflefest VIII, an annual event that drew 73 teams last year. Last year there were 150 commitment cards submitted after the Power Team service, and hundreds for a community picnic and thousands to view the community fireworks display. 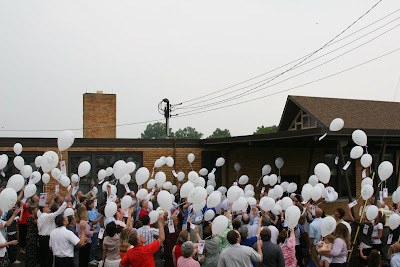 A balloon launch (in the picture) was performed after the morning service. Each balloon contained information for Wifflefest and a prayer request. This year former Cleveland Browns punter Bryan Wagner will be the Sunday morning speaker, and there will be a community hog roast for the picnic. Your prayers for an effective outreach will be appreciated.